This 4-star luxury lodge offers 8 self-catering chalets, the ideal bush lodge accommodation for an overnight stop or weekend away. 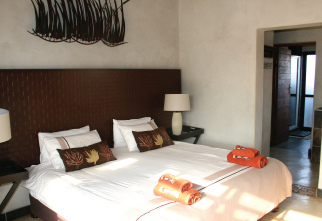 The layout also makes the ideal venue for an exclusive group of up to 18 people. Our new colonial styled interior and architecture embraces nature at every turn and offers all the privacy and superior comfort you would need for uninterrupted relaxation. 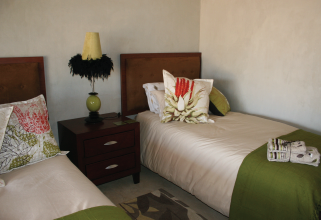 The self-catering chalets feature complete kitchens, large double room with sleeper couch and air conditioning, roomy bathroom with double vanity as well as an outdoor rock shower. 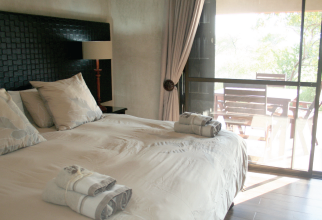 Each chalet also has a patio with a built in braai and patio set, overlooking the waterhole. 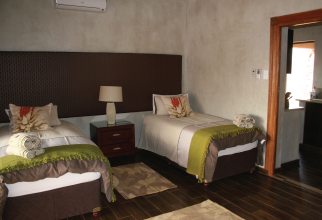 Each lodge chalet has an en-suite bathroom, bar fridge, coffee bar, air conditioner, ceiling fan and a deck overlooking the waterhole. 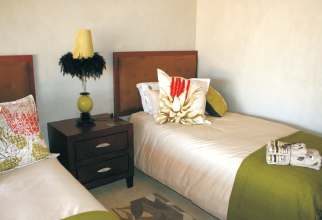 Take a look at our bush lodge accommodation offers. Meals can be arranged on requests prior to arrival. During catered stays our cuisine is mostly traditional South African. Braais and game are our specialties. Groups booking and longer stays to be quoted at special rates. 50% Deposit is required to secure a reservation. No refunds on cancellation of bookings less than 2 weeks prior to the arrival date. The balance is due in full prior to arrival as we have no credit card facilities. 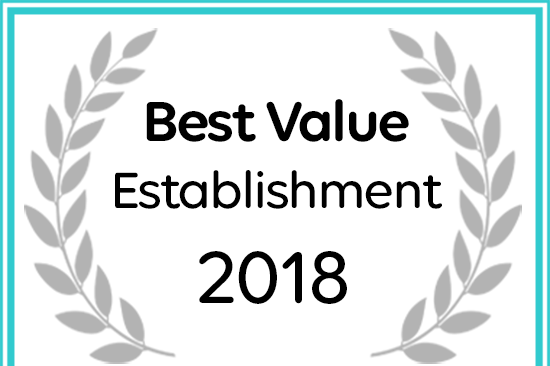 Please use the arrival date and your name as reference on your deposit.